Here’s some fodder for your weekend conversation with your barn buddies. Bernado Fire. People and horses were evacuated from around San Diego county in Southern California this week as a wildfire tore through the area. Hundreds of horses ended up at the Del Mar Fairgrounds. The San Diego Humane Society has opened a help line for assistance with evacuations for animals at 619-299-0871. You can find out more information about resources for animal owners here. 50-to-1. The story of 2009 Kentucky Derby winner Mine That Bird is coming to theaters. We profiled it in Horse Illustrated a few months ago. Now you can read a sort of lukewarm review of it from Variety. They had high praises for jockey Calvin Borel, who played himself. Derby winner California Chrome is the favorite to win Saturday’s Preakness Stakes. If he wins there, will he go on to win the Triple Crown? Statistically, probably not, but every year, race fans hope. Oh, COME ON. Do we really need more reinforcement of the idea that horse people are a bunch of superficial rich people? If they wanted to do a realistic reality show about horse people and fashion, you’d see someone pawing through the clearance rack at TJ Maxx in hopes of finding something that will camouflage slobber stains and horse hair. IHSA National Championships. If you love stories where the underdog wins, you wouldn’t have enjoyed this year’s championships. Centenary College took the hunt seat title for the third time in five years! Wow. Ohio State University won its 10th team title. In other college news, my alma mater, William Woods University, has launched an online graduate degree program in which you can earn a Masters of Education in equestrian education. You know, I’ve spent a fair amount of time defending college equine programs from the old timers who believe college is only for book learnin’. (We had over 100 horses on campus, and students took care of them. It is hands on, guys.) But, if you’re a working instructor and want to take the next step toward becoming a college professor or something, maybe this is the way. 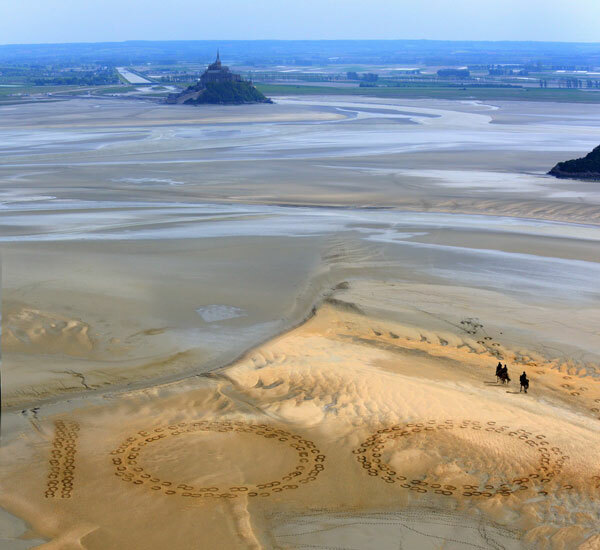 100 Days to the World Equestrian Games! That is, the Alltech FEI World Equestrian Games 2014 in Normandy. They did a cool and very temporary art exhibit on Normandy Beach to commemorate the milestone. See how they did it here. Pay for your riding lessons with fake money. I’m not going to lie to you. I don’t understand Bitcoins. But I never took economics and I barely understand dollars and cents, either. In any case, a Morgan Horse farm in Kansas is accepting Bitcoins for payment for lessons, training and other services that they provide. They actually announced it a year ago, but it just reached my news alerts this week. I wonder if anyone has taken them up on this payment option. Queen Elizabeth. This isn’t news, but it is a sweet photo of the Queen at the Royal Windsor Horse Show with some musings about what kind of person she might have been had she not been born into royalty. It is interesting that of all the photos you see of her, the ones where she’s smiling are nearly always taken at some sort of equestrian event or location. And finally, if you know someone with a horse on medication for EPM, you might want to pass this along. At least two horses have died after being treated with an EPM drug. It’s not known if there was an error in compounding or if the drugs were administered incorrectly, but it’s worth talking to a vet about if this affects your horse. I agree with the comment about looking on the clearance rack at TJ max. Those are the REAL HORE PEOPLE.Thats what this show should be about.Cause the way it sounds its another show about rich people. Why not do one about people who give up everything to keep their horses.Not what clothes they wear to walk around the barn in.